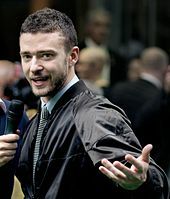 Justin Timberlake (pictured) earned his second and third US number-one albums with The 20/20 Experience and The 20/20 Experience – 2 of 2, respectively. The 20/20 Experience was the year's best selling album in the US. The highest-selling albums and EPs in the United States are ranked in the Billboard 200, which is published by Billboard magazine. The data are compiled by Nielsen Soundscan based on each album's weekly physical and digital sales. In 2013, a total of 44 albums claimed the top position of the chart. One of which, country singer Taylor Swift's album Red started its peak in late 2012. Justin Timberlake's album The 20/20 Experience was the longest-running album of the year, staying atop the chart for three consecutive weeks. Other albums with extended chart runs include Red by Taylor Swift, Babel by Mumford & Sons, Random Access Memories by Daft Punk, Magna Carta Holy Grail by Jay-Z, Crash My Party by Luke Bryan and The Marshall Mathers LP 2 by Eminem; each spent two weeks on the top position. Throughout 2013, only two acts achieved multiple number-one albums on the chart: Justin Timberlake with The 20/20 Experience and The 20/20 Experience – 2 of 2, and Luke Bryan with Spring Break...Here to Party and Crash My Party. The 20/20 Experience sold 968,000 copies in its first week following its release, becoming the highest-selling album during the debut week. Eminem's The Marshall Mathers LP 2 sold 792,000 copies in its first week, making it the second album with the highest sales during the opening week. Meanwhile, Beyoncé Knowles notched her fifth number-one album with the album of her name; it was also the largest debut sales week for a female artist in 2013, and outselling Knowles' previous albums' debut figures. Knowles is the only female artist in Billboard 200 history to have her first five albums reach number one. The 20/20 Experience was the biggest-selling album of 2013, with 2,373,000 copies sold in the US. 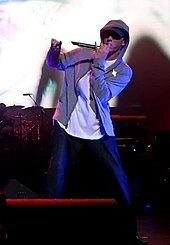 Eminem (pictured) scored his sixth number-one album on the chart with The Marshall Mathers LP 2, claiming the top spot for two nonconsecutive weeks. 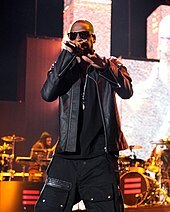 Jay-Z (photo) gained his thirteenth US number-one album with Magna Carta Holy Grail. Beyoncé (pictured)'s self-titled studio album debuted atop the chart, becoming the largest debut sales week for a female artist in 2013. ^ Caulfield, Keith (2012-10-30). "Taylor Swift's 'Red' Sells 1.21 Million; Biggest Sales Week for an Album Since 2002". Billboard. Prometheus Global Media. Retrieved 2013-12-26. ^ a b Caulfield, Keith (2013-04-10). "Justin Timberlake Earns Third Week at No. 1, Band Perry Debuts at No. 2". Billboard. Prometheus Global Media. Retrieved 2013-04-10. ^ a b Caulfield, Keith (2013-12-13). "Justin Timberlake's '20/20 Experience' Tops Billboard 200 Year-End Albums Chart". Billboard. Prometheus Global Media. Retrieved 2013-12-26. ^ a b c Caulfield, Keith (2013-12-18). "It's Official: Beyonce Makes History With Fifth No. 1 Album". Billboard. Prometheus Global Media. Retrieved 2013-12-18. ^ Grein, Paul (2013-12-04). "Bye, Bye, Bye, 'N Sync! One Direction Makes Boy Band History". Yahoo! Music. Retrieved 2013-12-26. ^ Caulfield, Keith (2012-12-26). "T.I. 's 'Trouble Man' Debuts at No. 2 on Billboard 200, Taylor Swift Still Rules". Billboard. Prometheus Global Media. Retrieved 2012-12-26. ^ Caulfield, Keith (2013-01-03). "Taylor Swift's 'Red,' 'Les Mis' Soundtrack Lead Billboard 200 Chart". Billboard. Prometheus Global Media. Retrieved 2013-01-03. ^ Caulfield, Keith (2013-01-09). "'Les Miserables' Soundtrack Hits No. 1 on Billboard 200 Chart". Billboard. Prometheus Global Media. Retrieved 2013-01-09. ^ Caulfield, Keith (2013-01-16). "Chris Tomlin Scores First No. 1 Album on Billboard 200 Chart". Billboard. Prometheus Global Media. Retrieved 2013-01-16. ^ Caulfield, Keith (2013-01-23). "A$AP Rocky Debuts at No. 1 on Billboard 200 Albums Chart". Billboard. Prometheus Global Media. Retrieved 2013-01-23. ^ Caulfield, Keith (2013-01-30). "Gary Allan Earns First No. 1 Album on Billboard 200". Billboard. Prometheus Global Media. Retrieved 2013-01-30. ^ Caulfield, Keith (2013-02-06). "Justin Bieber Scores Fifth No. 1 Album on Billboard 200 Chart". Billboard. Prometheus Global Media. Retrieved 2013-02-06. ^ Caulfield, Keith (2013-02-13). "Josh Groban Earns Third No. 1 Album on Billboard 200 Chart". Billboard. Prometheus Global Media. Retrieved 2013-02-13. ^ Caulfield, Keith (2013-02-20). "Mumford & Sons Make Grammy-Fueled Return to No. 1 on Billboard 200". Billboard. Prometheus Global Media. Retrieved 2013-02-20. ^ Caulfield, Keith (2013-02-27). "Mumford & Sons' 'Babel' No. 1 for Fifth Week on Billboard 200 Chart". Billboard. Prometheus Global Media. Retrieved 2013-02-27. ^ Caulfield, Keith (2013-03-06). "Bruno Mars Scores First No. 1 Album on Billboard 200 Chart". Billboard. Prometheus Global Media. Retrieved 2013-03-06. ^ Caulfield, Keith (2013-03-13). "Luke Bryan Scores First No. 1 Album on Billboard 200 Chart". Billboard. Prometheus Global Media. Retrieved 2013-03-13. ^ Caulfield, Keith (2013-03-20). "Bon Jovi Debuts at No. 1 on Billboard 200, David Bowie at No. 2". Billboard. Prometheus Global Media. Retrieved 2013-03-20. ^ Caulfield, Keith (2013-03-20). "Bon Jovi, David Bowie Lead Six Top 10 Debuts on Billboard 200". Billboard. Prometheus Global Media. Retrieved 2013-03-20. ^ Caulfield, Keith (2013-03-26). "Official: Justin Timberlake's '20/20 Experience' Sells 968,000, Debuts at No. 1 on..." Billboard. Prometheus Global Media. Retrieved 2013-03-27. ^ Caulfield, Keith (2013-03-26). "Justin Timberlake Starts Atop Billboard 200, Earns Third-Largest Digital Week Ever". Billboard. Prometheus Global Media. Retrieved 2013-03-27. ^ Caulfield, Keith (2013-04-03). "Justin Timberlake's '20/20' Spends Second Week at No. 1 on Billboard 200". Billboard. Prometheus Global Media. Retrieved 2013-04-03. ^ Caulfield, Keith (2013-04-16). "Paramore Earn First No. 1 Album On Billboard 200". Billboard. Prometheus Global Media. Retrieved 2013-04-16. ^ Caulfield, Keith (2013-04-24). "Fall Out Boy Tops Kid Cudi on Billboard 200 Chart". Billboard. Prometheus Global Media. Retrieved 2013-04-24. ^ Caulfield, Keith (2013-05-01). "Michael Buble Scores Fourth No. 1 Album on Billboard 200 Chart". Billboard. Prometheus Global Media. Retrieved 2013-05-01. ^ Caulfield, Keith (2013-05-08). "Kenny Chesney Logs Lucky Seventh No. 1 Album on Billboard 200". Billboard. Prometheus Global Media. Retrieved 2013-05-08. ^ Caulfield, Keith (2013-05-15). "Lady Antebellum Scores Third No. 1 Album, 'Gatsby' Debuts Strong at No. 2". Billboard. Prometheus Global Media. Retrieved 2013-05-15. ^ Caulfield, Keith (2013-05-22). "Vampire Weekend Debuts At No. 1 On Billboard 200". Billboard. Prometheus Global Media. Retrieved 2013-05-22. ^ Caulfield, Keith (2013-05-28). "Official: Daft Punk's 'Random' Debuts at No. 1 on Billboard 200 With 339,000". Billboard. Prometheus Global Media. Retrieved 2013-05-28. ^ Caulfield, Keith (2013-06-05). "Daft Punk Scores Second Week at No. 1 on Billboard 200 Chart". Billboard. Prometheus Global Media. Retrieved 2013-06-05. ^ Caulfield, Keith (2013-06-12). "Queens of the Stone Age Get First No. 1 Album on Billboard 200 Chart". Billboard. Prometheus Global Media. Retrieved 2013-06-12. ^ Caulfield, Keith (2013-06-19). "Black Sabbath Earns First No. 1 Album on Billboard 200 Chart". Billboard. Prometheus Global Media. Retrieved 2013-06-19. ^ Caulfield, Keith (2013-06-26). "Official: Kanye West's 'Yeezus' Sells 327,000; Debuts at No. 1 on Billboard 200 Chart". Billboard. Prometheus Global Media. Retrieved 2013-06-26. ^ Caulfield, Keith (2013-07-03). "Wale Scores First No. 1 Album on Billboard 200 Chart". Billboard. Prometheus Global Media. Retrieved 2013-07-03. ^ Caulfield, Keith (2013-07-10). "J. Cole's 'Born Sinner' Jumps to No. 1 on Billboard 200 Chart". Billboard. Prometheus Global Media. Retrieved 2013-07-10. ^ Caulfield, Keith (2013-07-17). "Jay-Z's 'Magna Carta' Debuts at No. 1 on Billboard 200 Chart". Billboard. Prometheus Global Media. Retrieved 2013-07-17. ^ Caulfield, Keith (2013-07-24). "Jay Z Stays Atop Billboard 200, Sara Bareilles Debuts at No. 2". Billboard. Prometheus Global Media. Retrieved 2013-07-24. ^ Caulfield, Keith (2013-07-31). "Selena Gomez Earns First No. 1 On Billboard 200". Billboard. Prometheus Global Media. Retrieved 2013-07-31. ^ Caulfield, Keith (2013-08-07). "Robin Thicke Gets First No. 1 Album On Billboard 200". Billboard. Prometheus Global Media. Retrieved 2013-08-07. ^ Caulfield, Keith (2013-08-14). "The Civil Wars Debut at No. 1 on Billboard 200 Albums Chart". Billboard. Prometheus Global Media. Retrieved 2013-08-14. ^ Caulfield, Keith (2013-08-21). "Luke Bryan's 'Crash My Party' Debuts at No. 1 on Billboard 200". Billboard. Prometheus Global Media. Retrieved 2013-08-21. ^ Caulfield, Keith (2013-08-28). "Luke Bryan Nets Second Week Atop Billboard 200, John Mayer Debuts at No. 2". Billboard. Prometheus Global Media. Retrieved 2013-08-28. ^ Caulfield, Keith (2013-09-04). "Avenged Sevenfold Earns Second No. 1 Album On Billboard 200". Billboard. Prometheus Global Media. Retrieved 2013-09-04. ^ Caulfield, Keith (2013-09-11). "Ariana Grande Debuts At No. 1 On Billboard 200". Billboard. Prometheus Global Media. Retrieved 2013-09-11. ^ Caulfield, Keith (2013-09-18). "Keith Urban Edges the Weeknd for No. 1 Debut on Billboard 200". Billboard. Prometheus Global Media. Retrieved 2013-09-18. ^ Caulfield, Keith (2013-09-25). "Jack Johnson Scores Fourth No. 1 Album on Billboard 200". Billboard. Prometheus Global Media. Retrieved 2013-09-25. ^ Caulfield, Keith (2013-10-02). "Drake's 'Nothing Was the Same' Debuts at No. 1 on Billboard 200". Billboard. Prometheus Global Media. Retrieved 2013-10-02. ^ Caulfield, Keith (2013-10-09). "Justin Timberlake Scores His Second No. 1 Album Of 2013". Billboard. Prometheus Global Media. Retrieved 2013-10-09. ^ Caulfield, Keith (2013-10-16). "Miley Cyrus' 'Bangerz' Debuts At No. 1 On Billboard 200". Billboard. Prometheus Global Media. Retrieved 2013-10-16. ^ Caulfield, Keith (2013-10-23). "Pearl Jam Earns Fifth No. 1 Album On Billboard 200". Billboard. Prometheus Global Media. Retrieved 2013-10-23. ^ Caulfield, Keith (2013-10-30). "Katy Perry's 'PRISM' Shines At No. 1 On Billboard 200". Billboard. Prometheus Global Media. Retrieved 2013-10-30. ^ Caulfield, Keith (2013-11-06). "Arcade Fire's 'Reflektor' Debuts At No. 1 On Billboard 200". Billboard. Prometheus Global Media. Retrieved 2013-11-06. ^ Caulfield, Keith (2013-11-13). "Eminem's 'Marshall Mathers LP 2' Scores Second-Biggest Debut of Year". Billboard. Prometheus Global Media. Retrieved 2013-11-13. ^ Caulfield, Keith (2013-11-20). "Lady Gaga Scores Second No. 1 Album With 'ARTPOP'". Billboard. Prometheus Global Media. Retrieved 2013-11-20. ^ Caulfield, Keith (2013-11-27). "Eminem's Back at No. 1 with 'Marshall Mathers LP 2'". Billboard. Prometheus Global Media. Retrieved 2013-11-27. ^ Caulfield, Keith (2013-12-04). "One Direction Scores Historic Third No. 1 Album on Billboard 200 Chart". Billboard. Prometheus Global Media. Retrieved 2013-12-04. ^ Caulfield, Keith (2013-12-11). "Garth Brooks Earns Ninth No. 1 Album, Britney Spears Debuts At No. 4". Billboard. Prometheus Global Media. Retrieved 2013-12-11. This page was last edited on 14 March 2019, at 11:25 (UTC).